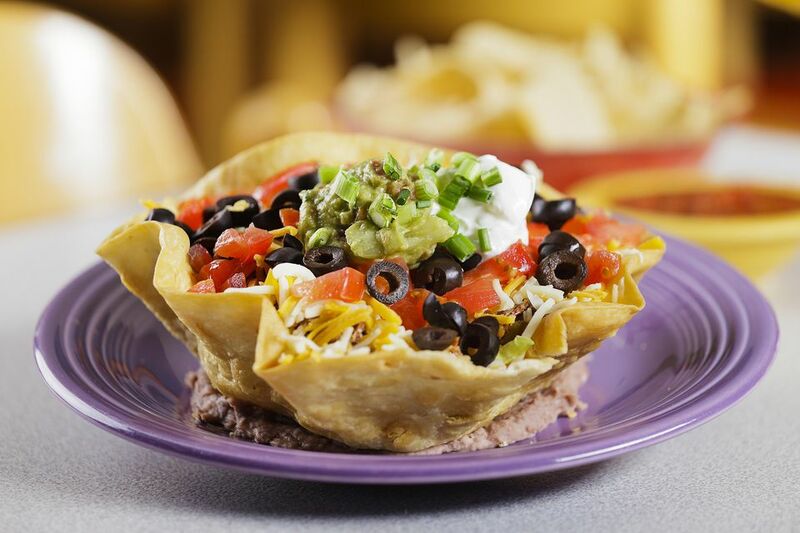 Most everyone has had a taco salad at a restaurant before. It's delicious, has an explosion of flavors, and is a great way to switch up the normal Tex-Mex-style dish. Instead of going out to get one next time, try making on at home. Making your own is very easy, much less expensive, and tastier! You can even use leftover burgers to make this recipe. Just crumble up the beef and add it to the veggies after they have been sautéed. If you're doing this, start cooking the onions and garlic in a couple of tablespoons of olive oil. You can serve this salad two ways: add the hot beef mixture to the greens right away, or cool the beef mixture for about 30 minutes and refrigerate it. Then stir well and use it to top the greens. In a large skillet, cook the ground beef with onion, garlic, and jalapeño, stirring to break up meat. When meat is browned, drain well. Add taco seasoning mix, beef stock, and salsa and bring to a simmer. Simmer, stirring frequently, for 5 to 7 minutes until thickened. Remove from heat and stir in French dressing. You can make the salad now, or cool and refrigerate this mixture. To make the salad, combine lettuce with beans, bell peppers, and tomatoes in a large serving bowl. Top with the beef mixture. Top with avocados, cheeses, olives, sour cream, and tortilla chips, and serve immediately. Instead of the chips, you can serve this salad in Tostada shells that you can find at the grocery store. Just warm the shells as directed on the package and serve this salad in them.